My love affair with fried chicken is well documented. And, for years, it has been an exclusive relationship with just one beloved recipe (I won't name it; you can guess). I have been committed and faithful. But when Chicken Shack, the new comfort food eatery with fine dining DNA, opened up sleek new digs on a trendy stretch in Spenard, I'll admit I was tempted. Perhaps, I thought, there was room in my life for more than one type of drumstick. Chicken Shack's menu boasts old-school American cuisine (fried chicken, bacon-centric sandwiches and burgers) and gives them a modern spin (kale slaw, blueberry jam vinaigrette, juniper black pepper mayo and blistered shishito peppers). Put aside your homey notions of a diner, a dive or a roadhouse chock-full of Americana. Chicken Shack is sleek and spare with a Scandinavian vibe: Bleached wood, brushed steel, clean lines and right angles prevail. And while the space cannot be described as cozy, it is decidedly serene. Bottom line: No shacks were harmed in the making of the Chicken Shack. There was no question that we were going to try the basic fried chicken. We opted for the half shack ($16) — three pieces of chicken (two dark, one white) with a side dish (we chose kale slaw). 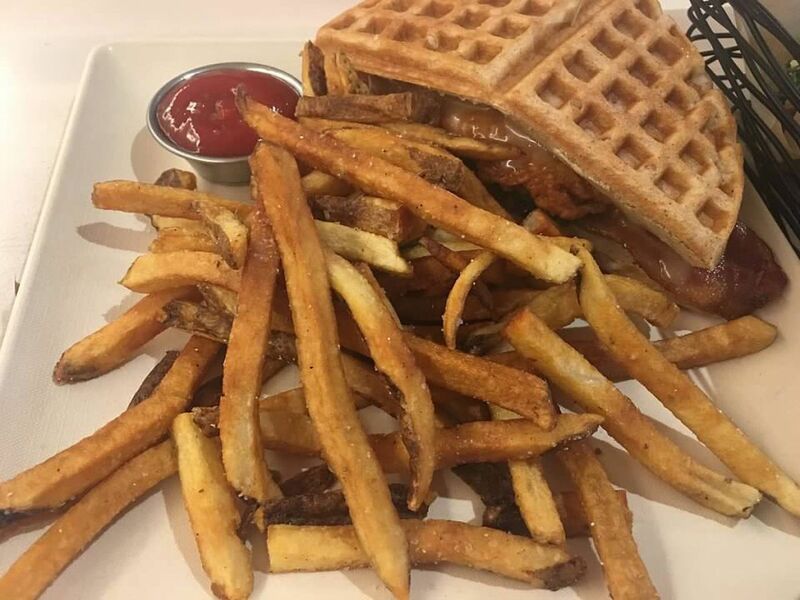 I also ordered another signature dish – the chicken and waffle sandwich ($17). The meal had some very high highs and one very surprising low. Let's start with what we loved. The fried chicken is, simply put, a winner. It boasts a super crispy, deep brown crust and a juicy, flavorful interior. One bite in and I was already regretting not opting for a full order. My daughter loved the fact that the white piece is served boneless and eats like an upscale chicken tender. I also loved the kale and Brussels sprout slaw, which is served, whimsically, in a crisp waffle cone. This salad is perfectly balanced. The bitterness of the greens is offset by the sweetness of dried cherries. And the salad is studded throughout with crunchy, salted peanuts. It's a thoughtful and addictive side dish. To be perfectly honest, the cone does nothing for this dish flavor-wise, but it's adorable so I'm here for it. In fact, I would like to see more food in cones. Call your representatives. Our other side dish, the house-made french fries, were pretty close to perfect. These are not the pale crispy variety of fries that often originate in freezer bags. Rather, these are skin-on, cooked to a golden brown with a tender, potato-y flavor and just-right seasonings. These fries are also served poutine-style (called "The Hot Mess" on the menu) with gravy and cheese curds. Unfortunately, I was less happy with my chicken and waffle sandwich. It looked beautiful when it arrived at the table. And conceptually, it's a great sandwich – I loved the sweetness of the honey, the salt from the bacon, and the spice from the blistered peppers. Everything about this sandwich worked except for … I hate to say it … the chicken. There was something unpleasant about the texture of the boneless breast. It was dense and rubbery and the coating was too thick and slid right off of it when you cut or bit into it. I was perplexed. I had already tried a piece of boneless fried chicken breast at that exact same meal. And it was delicious. I'm not sure why they change their chicken formula when preparing a sandwich. 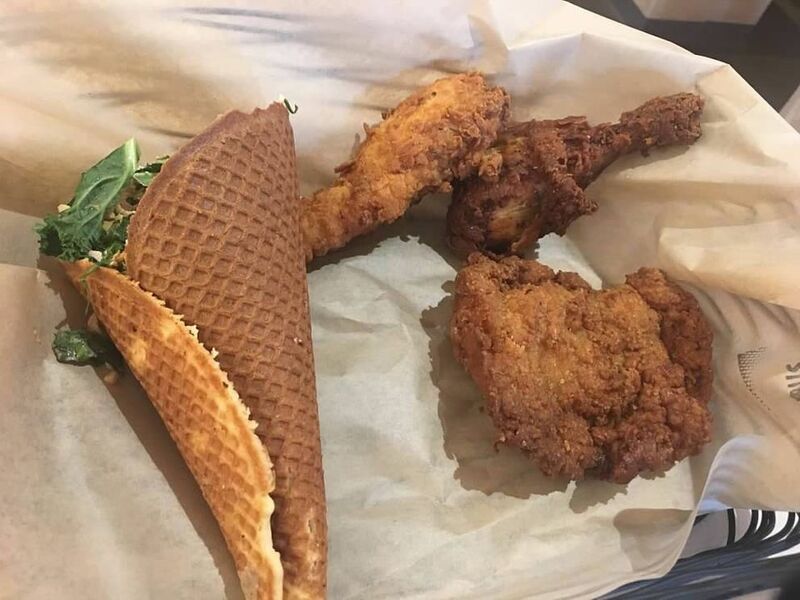 If I could have put the fried chicken breast from the half shack into the waffle and fixings of my sandwich, I would be raving about this dish. 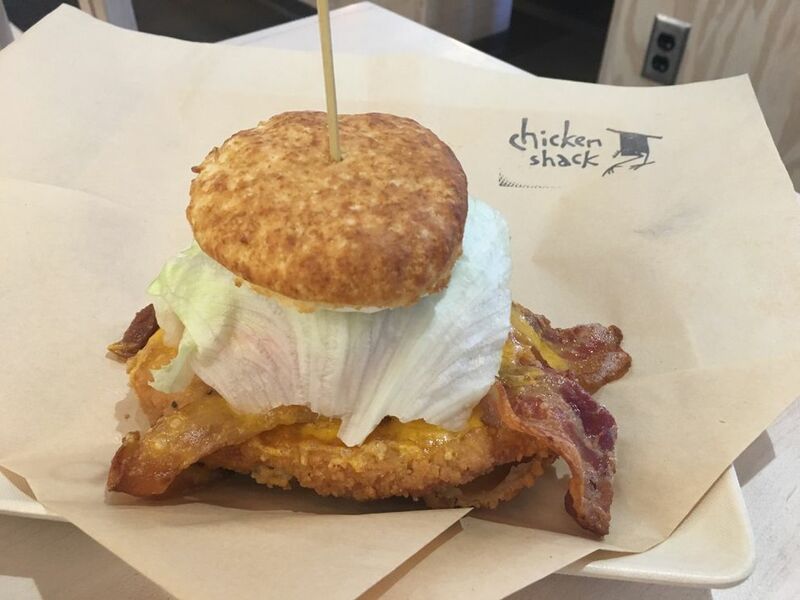 I wondered if my sandwich experience was an outlier – maybe an off-moment in the kitchen — so when I returned the following week, I ordered the chicken biscuit sandwich ($15) after verifying that they use the same chicken in both. Again, the chicken itself was tough and rubbery with a mushy crust that didn't adhere to the meat. Again, the rest of the sandwich was terrific. The house-made biscuits are fluffy, flaky and flavorful. The bacon, cheddar, tomato and ranch flavor combination is a classic. In the end, I removed the chicken and enjoyed this sandwich as a biscuit BLT. Happily, my husband's wild boar burger ($16.50) was good and he shared it only reluctantly. This burger is flavorful and well-seasoned with a good sear resulting in a patty with a nice, toothsome crust. 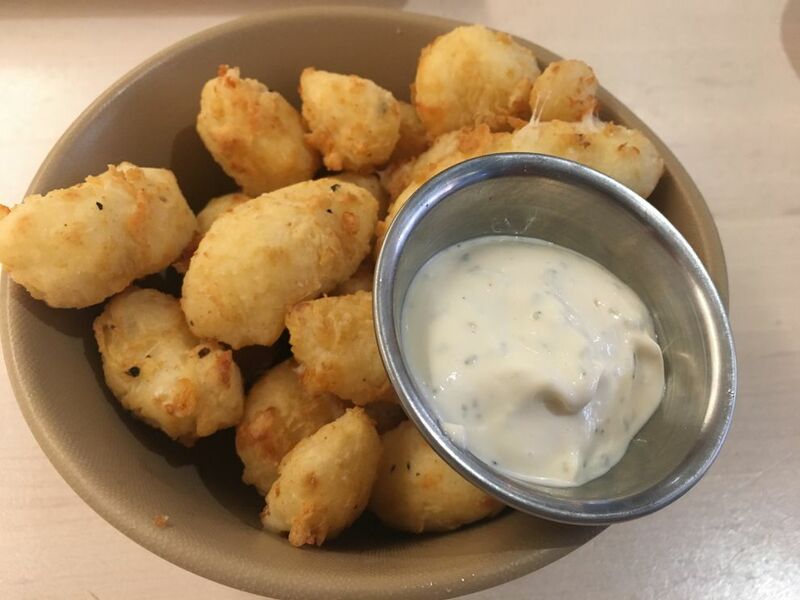 I wasn't even going to mention the fried cheese curds ($6) that we shared because fried cheese falls under the "what's not to like?" category of food criticism. But I had missed out on this delicacy at this year's fair and I needed to make up for lost calories. Guess what? They're scrumptious. My husband summed it up: "These are amazing. Even for fried cheese." If the atmosphere is cool, the service is decidedly warm. There's a familial air in the room and the staff are friendly and chatty with the patrons and each other. Chicken Shack might be ironing out a glitch or two, but I'm still excited about it: Fantastic fried chicken, friendly service, and state fair staple or two all wrapped up in a chic and modern package. And while I'll never leave my first fried-chicken love, I might step out on it once in a while.